If you want great vintage USA tone, it doesn't get much better than this. Top-drawer tone; perfect amp for recording. It's a one-trick pony, but a great trick; shamelessly expensive. From 1955 to 1957, Fender made what would become some of the last changes to its so-called 'tweed' amplifier range, to arrive at the coveted narrow panel series that went on to become the template for so many other designs. The Bassman also changed from a 1x15 cabinet to a 4x10 in 1955, serving as the inspiration for another well-known amplification icon. However, despite the temporary fashion for big stacks and 100-watt tops, the small tweed Fender has remained indispensable, providing the tonal inspiration for countless gold albums and hit singles. 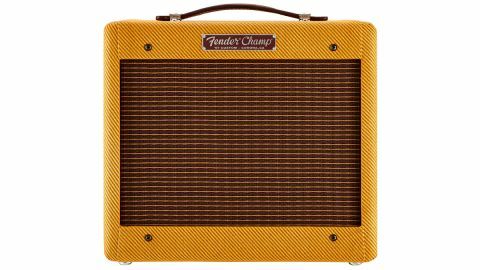 Over the years, Fender has reissued both amps in various guises, but this year the company has chosen to push the boat out with a Summer NAMM debut of not one, but four Custom Shop tweed amps of which this one, the Champ, is likely to be a runaway hit. The combo is as close as can be faithful replica of their original 1957 counterpart. The cabinet is finger-jointed solid pine, with expertly fitted cotton twill covering, gold/brown grille cloth, period-correct badge, leather strap handle and metal glide. The chassis is chrome-plated steel, with slotted side panel to improve strength and assist in ventilation. Chickenhead knobs that go up to 12 adorn the control panel. Inside, the electronics are fairly close to the original, using a black eyelet board to support all the small components, with neat hand wiring to the valve bases and front and rear panel connections. If you're in the market for a vintage tweed combo, owning one that's every bit as good as the original but built to modern standards and set up for our mains voltage is really a no-brainer. Original Champs incorporated the on/off switch in the volume control; on the reissue, Fender has wisely added a separate toggle switch and a top-mounted fuse holder. The combo uses Fender's recently introduced Pure Vintage yellow coupling capacitor - re-engineered versions of the original paper, foil and resin Astrons, which some tweed aficionados consider to be crucial for the right tone. Other ingredients to Fender's updated tweed recipe include Alnico loudspeakers - an eight-inch Weber on the Champ and an Eminence-built Fender Special Design 12-inch on the Deluxe - and re-worked tapers on the volume controls for improved controllability, which is particularly relevant to the Deluxe. the exception of a few safety changes, such as no cloth-covered hook-up wire, the combo looks like it just rolled off the old Fullerton production line. The amp powers on with minimal background hum and hiss. Valve-rectified circuits take a little time for all the voltages to stabilise and after a few minutes the hum reduces to more than satisfactory levels. It is fitted with a 12AY7 in the V1 position, which improves clean headroom at the expense of overall volume. This is the original valve specification, but many guitarists prefer to use the higher gain and more commonly available 12AX7, which will cause the amp to break up earlier, typically well under the halfway point on the volume control. We tried the amp out with a variety of single-coil and humbucking guitars and, in simple circuits like these, the guitar has a very strong influence on the amp's behaviour and the character of individual instruments is more noticeable. Our Les Paul, for example, produced plenty of sustain and drive with both amps using a 12AX7 at lower volume settings, while a Strat fitted with regular low-ish output single coils still managed a respectable crunch. The Champ's single 6V6 output valve produces a massive overdriven sound, with pure Class A sweet harmonics and almost endless sustain when fully cranked. The truncated frequency response of the eight- inch Weber loudspeaker means the Champ can sound a little 'boxy' - it's all midrange and not a lot else - but this translates into a superb recording tone that needs little or no EQ to punch through a mix. Add some reverb and you're into Rocky Mountain Way territory very quickly. The Champ sounds great with slide and if you want some greasy blues harp sounds, it's great for that, too, proving surprisingly versatile for an amp with just one control. It's taken a long time for this legendary amplifier to reappear in Fender's catalogue. Together with the Custom '57 Pro, Deluxe and Twin, it is part of a quartet that promises unearthly tone for all who want to experience the thrill and fun of owning a real vintage amp, without the pitfalls and fragility of 60-year-old electronics. And that's the key thing. Vintage amplifiers don't age gracefully. Capacitors dry out and short-circuit, the insulation on old transformer windings isn't resistant to overheating, while repeated hot/cold cycling can open up dry solder joints and overheated resistors can drift from their true value. And then there's the mains voltage - original tweeds are configured for USA power, and in stock configuration they're not properly earthed. Now, hunting down and owning vintage amps is fun, but we'd never want to rely on one that's been around for six decades when on stage. So, if you're in the market for a vintage tweed combo, owning one that's every bit as good as the original but built to modern standards and set up for our mains voltage is really a no-brainer.